Workplace Gallery are pleased to present space/socialspace a group exhibition of new work by Eric Bainbridge, Ralf Brög, Lothar Götz and James Hutchinson. Conceived initially as a collaborative project between four artists currently working together within the Fine Art department at Sunderland University space/socialspace provides an overarching framework for research that is increasingly focused on issues of space in relation to a public audience, and space (types of space) encountered as physical or immaterial space. 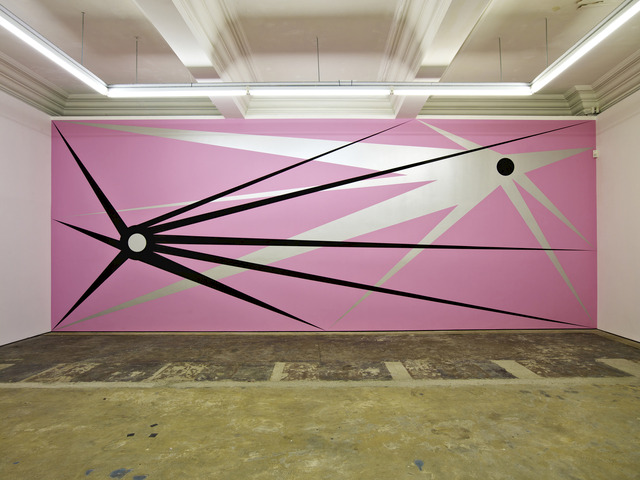 Lothar Götz examines the effect of colour in the form of large scale ‘wall paintings’ on existing or planned architectural spaces. ‘The Ghost of the Bauhaus’ is a large work across the full south wall of the gallery space. A geometric composition in three colours (black, silver and pink) ‘The Ghost of the Bauhaus’ has clear roots in early modernist abstraction. Götz’ work also functions as a kind of extended form of self- portraiture - by proxy. ‘The Ghost of the Bauhaus’ is extrapolated from a small drawing by Götz titled ‘House for Lena Meyer Bergner’ a flattened architectonic abstract drawing that Götz has designated as a kind of refuge for Lena Meyer Bergner a student of Paul Klee at the Bauhaus in the early 20th Century. Götz’ affinity with Bergner becomes both a self-conscious act of empathy with an other and, conversely, an extension of the self of the artist in and through an other. Through his use of projection into an imagined, historical figure, Götz is able to engage with expressionism and the origins of abstraction without the heroic traps and pitfalls of direct authorship. In this way Götz connects his practice to Classical ideas of art as active fantasy – something practiced as part of a personal strategy to escape from reality.